Last week The Guardian had a piece on the "first science fiction book," an alchemy fantasy from 1617. I haven't read The Chemical Wedding (though there's a Kickstarter, now funded with 60k, that's producing a new edition), but I was instantly skeptical of the "first" claim, so took to Twitter to ask for ideas of precursors. 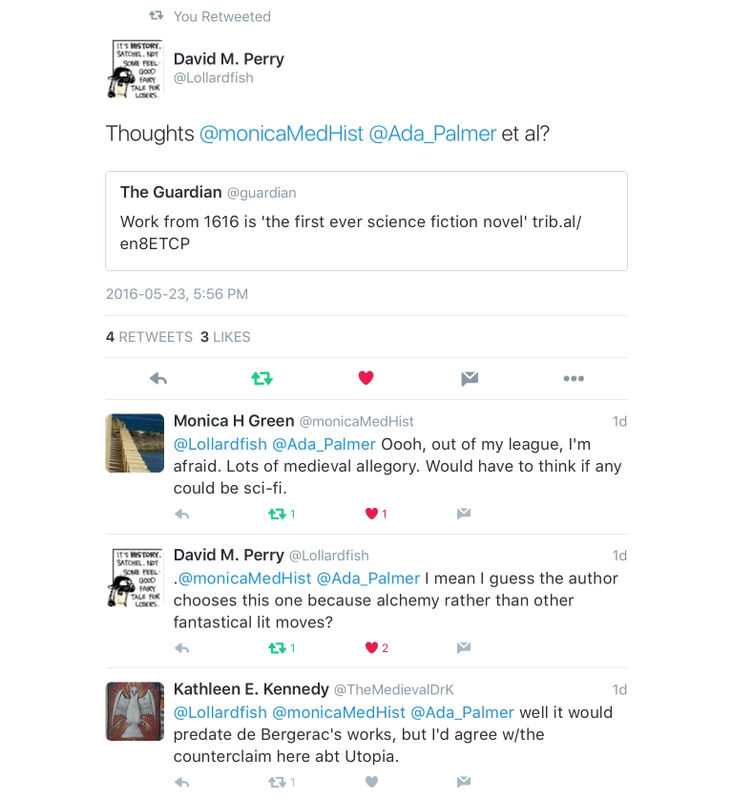 My own stirrings are not as an expert on medieval science fiction. They are in part the reaction of a medievalist: exposed like all medievalists to daily ignorance and ignominy, to the horrors of our field’s abuse through the perversion of “neomedievalism,” through which “medieval” has become a pejorative in so much common usage. We’re sensitive to that sort of thing. It hurts. And we feel responsible towards the medieval, protective, with a duty of care towards that which we care about and that cannot protect itself. As people who work with and in history, we’re hypersensitive to the dark side of modernity and the blind worship of modernity for modernity’s sake: a vapid vigorous cult of speed, fashion, and shiny newness that’s been seen before, most memorably in the rise of Fascist movements a mere century ago. This is very much where I stand as a medievalist. When someone claims a"first" status just after the Middle Ages, I am immediately suspect and defensive, because as a historian I pursue continuities over radical over-determined periodized change (I'm a lumper, not a splitter). It may be possible to come up with a definition of "science fiction novel" that only The Chemical Wedding and subsequent books fits, but it doesn't involve "science" or "fiction" or "novel" putting the three together. O'Brien looks at the medieval meanings of all three words, and as always, go read the whole post! So for any given time, place, and culture: “science fiction” would be made-up stories, dependent on imagination, built on and out of contemporary cutting-edge knowledge, and building an alternative world in which that knowledge has been pushed hypothetically, futuristically, beyond its contemporary bounds. This definition avoids limitations of exclusive cultural normativity, to open up an idea inclusively. It shouldn’t detract from what makes European and North American science fiction of the modern era; just as it doesn’t currently exclude later 20th- and 21st-century writers and writings from elsewhere: Russia, China, Indonesia, Nigeria, Mexico, First Nations here in North America, Australia, Japan, … In all cases, we’re looking at longer stories that work around technologies that are a step ahead, a day away in the future (ex. Roman de la Rose); and travel to other worlds (ex. the Alexander romances), where wonders beyond our understanding may be observed, from more technologically-advanced cultures: automata and AIs in Floire et Blanchefleur—a popular pan-European hit—and in exotic Eastern scenes in the earliest Western European medieval vernacular romances, the Romans de Troie, Thèbes, & Enéas (in a piquant premodern-postmodern take on Orientalism). The latter are already sources of wonder—sometimes downright made-up and stretching the bounds of imagination into the comedy of credulity—and may be wonders of alien cultures, such as in The Travels of Sir John Mandeville and other travel literature, and in another form of SF imaginative writing: maps. Meanwhile, the more obviously “other” medieval aliens of faery, and other places or worlds, populate Chrétien de Troyes’s romances and their kin in the Arthurian corpus; their very name related to fiction, their glamour and magics in the borderlands between advanced natural sciences and the unnatural. The distinction between alchemy and chemistry will remain to some extent unstable well into modernity, with magic as the border, through to the time of that other Crowley… And what should we do with travel to other other worlds like the world of the dead? As toyed with so subtly in the location and dislocation of Gorre in Chrétien’s Lancelot? A final other-worldliness and “science”: dream visions, and the supernatural paranormal otherworldly othertimely knowledge beyond of religious and spiritual writing, from saints’ miracles to ecstatic transports. Allegory as a form of knowledge that works through imagination, hypothesis, thinking forward and outside and beyond. Exemplary cases: the Roman de la Rose again; the writings of Machaut and Froissart; and at the other end of the medieval, some 5th century allegorical works: the Comentarii in Somnium Scipionis of Macrobius, and Martianus Capella’s De nuptiis Philologiae et Mercurii. The latter, much read over the next thousand years, might perhaps have some influence on Johann Valentin Andraea’s Chemical Wedding. Finally: I agree with O'Brien that the need to be first, the need to define YOUR FIELD, YOUR PERIOD, YOUR BOOK as first, as devoid of contact with that which came before, is an epistemological problem. Some of this stems from academia itself - we reward "firsts" and smile politely at "continuity," "incremental change," or same-as-it-ever-was. You don't win big prizes for locating a lack of change.